Bitcoin price hit new all-time highs yet again and it seems to be pulling back to give more bulls a chance to join in. Think it’ll bust through the latest highs in no time? Another day, another set of highs for bitcoin! Price busted through the resistance near $5800 then zoomed close to the $6200 major psychological barrier before retreating. 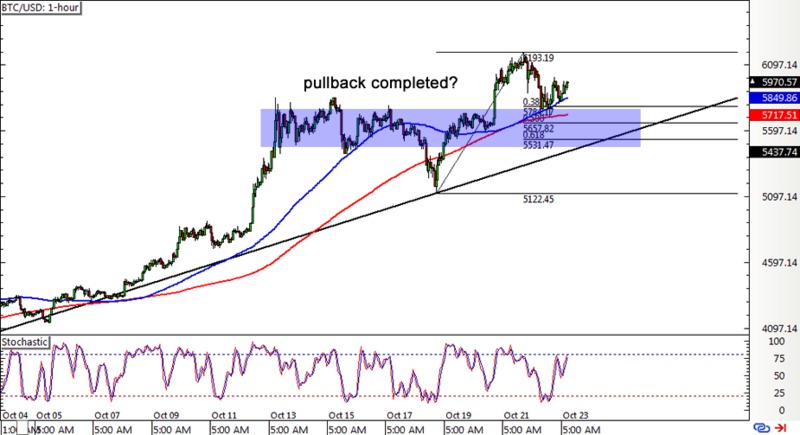 Applying the Fib tool on this big rally shows that the 38.2% to 50% levels are close to this broken resistance area. However, bitcoin already seems to have bounced off the 38.2% retracement level to indicate that buyers are eager to hop right back in. This lines up with the 100 SMA dynamic support after all, and the short-term moving average is above the longer-term 200 SMA to confirm that the uptrend could carry on. A larger correction could still last until the longer-term rising trend line and the 61.8% Fib. Ethereum broke down from the rising wedge formation earlier this month, indicating that sellers are gaining the upper hand. However, there could be room for a bounce or return in bullish pressure as price is currently testing an area of interest that has been holding up quite well. In particular, the $290 area has functioned as support then resistance then support again. Will it hold this time, though? 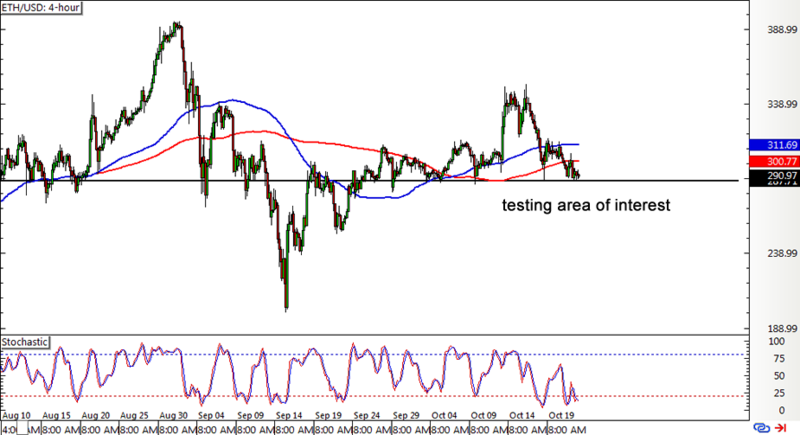 Stochastic is in the oversold area to signal that sellers need to take a break and let buyers take over. Aside from that, the 100 SMA is above the longer-term 200 SMA to suggest that the path of least resistance is to the upside. 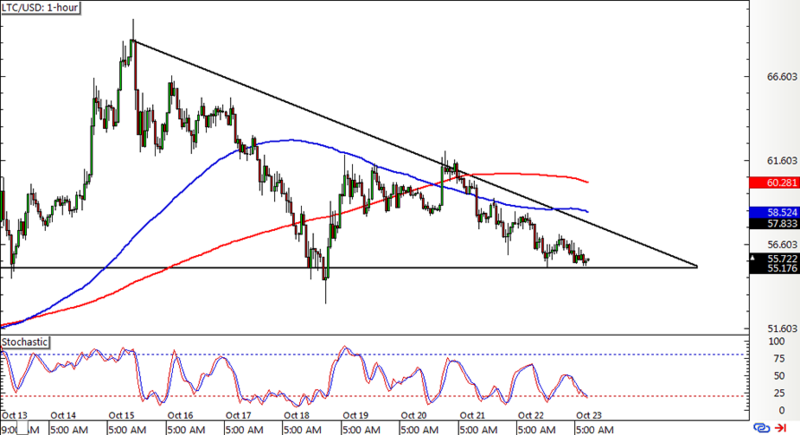 Litecoin continues to trend lower but is currently finding a floor at the bottom of a descending triangle pattern. A bounce could take it back up to the resistance, which is near the 100 SMA dynamic inflection point. Stochastic is still on the move down to indicate that sellers have the upper hand, but the oscillator is closing in on the oversold region to reflect exhaustion. The 100 SMA is below the longer-term 200 SMA to suggest that bearish momentum could stay in play and even trigger a downside break. The triangle spans $55.175 to $68.75 so the resulting selloff could last by the same height. On the other hand, an upside break past the triangle top could still hit the ceilings at the moving averages.